5 AM – My alarm goes off. Snooze! 5:47 AM – I've made it to the Farm and eat a quick breakfast while the Keurig brews a hot cup of joe. 6:22 AM – Where are these dudes?? We were supposed to meet at 6 but I don't mind waiting. 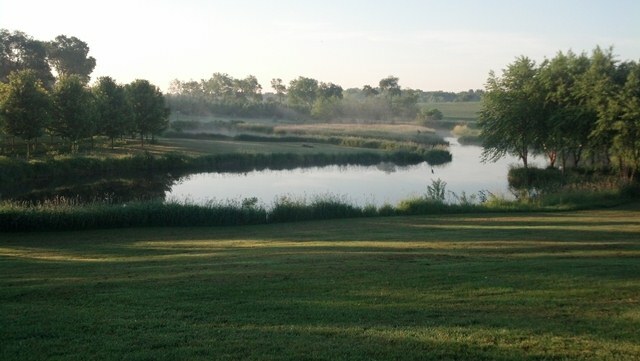 It's a beautiful morning on the Farm. Mist is rising off 4 Winds Pond and the bullfrogs are shouting to one another. 4 Winds Pond, 6 AM - a little piece of heaven. 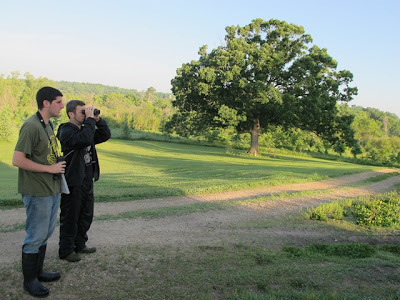 6:28 AM – Graham and Aaron arrive, offer me some binoculars and talk about the morning's agenda. They have hit the majority of the 80-some observation points plotted around the farm. I bought new rubber boots last night and am anxious to get them dirty and wet, so I request some points that are in the marsh. Request denied - they hit all those points the day before. Graham and Aaron at our first stop of the day. 6:32 AM – We roll up to point 44 and the observation begins. The process goes like this: they use a GPS device to navigate to a point. Once there, they talk about what they're initially hearing, set up a recorder, get their binoculars ready and grab a notebook. Then, they start a timer. For the next 10 minutes, they make minimal noise as they record all the calls and birds they're seeing. At the end of the 10 minutes, they talk about anything they weren't familiar with and use apps on their phones or Sibley Bird Guide to help identify. Nothing exciting or uncommon to note at our first stop, other than Graham teaching me how to identify a robin's call mnemonically ("cheer up! cheerily!"). 7:03 AM: We spy a cedar waxwing. As a novice I probably shouldn't be declaring favorites, but this bird might be it. I love the look of its smooth ("waxed") feathers and the combover! 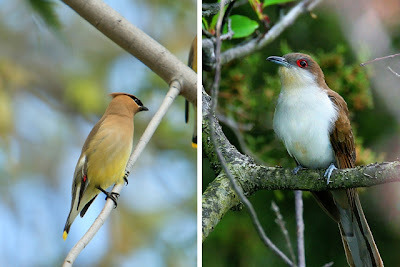 Cedar waxwing (left) and black-billed cuckoo. 7:21 AM: In a young, mixed-hardwood plantation now and we're listening to something that doesn't even sound like a bird. It has a low, gravely call, almost a rattle. Aaron is able to get a fairly good look at the bird: tan back, white breast and bold, bright red eyes. Based off that description and the interesting call, we (ok, they - I just tried to stay out of the way) put their heads together and deduce it is a black-billed cuckoo – the first they have found on the Farm. 7:29 AM: My brain works funny sometimes… this morning happens to be one of those times. I hear Graham mention the "Willow Flycatcher" and a few minutes later, I ask him about the "Yellow Anteater." Flycatcher, anteater... willow, yellow. Almost the same thing? 8:13 AM: Near Corn Pond now, finished with the 10 minutes of observation when we notice a flurry of yellow. I go check it out because at this point, I'm nearly an expert right? I get a good look at the bird and am blown away by the vibrancy of its plumage! 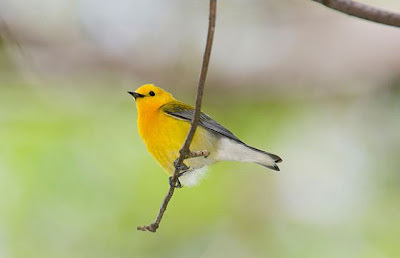 Graham gets a peek at it before it flies away and thinks it is a prothonotary warbler. But why such a complicated name for such a sweet little bird? 8:48 AM: We spot a beautiful male bluebird. He is hanging out in some spruce, flying around looking proud. His colors are so vibrant, it's almost startling. Nature is so cool! 10:01 AM: It's getting hot; my new boots are sweat machines. The bugs are eating me alive. And I just dropped my phone in goose poop. Time for me to call my stint as a bird observation intern over and out. Thanks Graham and Aaron for letting me tag along and for all the great work you're doing here!